This video has made the rounds before, but it warrants posting for anyone who hasn’t seen it yet. (There are many more out on the web, just a few of which are collected in this post over on MentalFloss.) We wanted to highlight this video in particular after reading the description on YouTube. 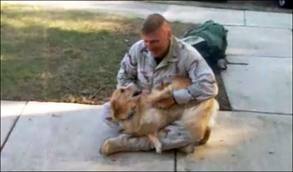 Andy, the National Guardsman in the video, posted this clip of his dog Gracie welcoming him home after a tour in Afghanistan. Gracie was rescued by Andy’s family after four months at a kill shelter and, as you can see, she is eternally grateful and devoted to her family. Andy originally posted the video assuming it would only be seen by his family; however, as often happens through the power of the Internet, the clip became a sensation and found its way to the Today show. The video has now been viewed over six million times. In the video description Andy make a very important point- he’s only one of many, many Americans serving our country, and not all have been so lucky to come home to their families and pets. Although not entirely comfortable with the amount of attention the video has garnered him directly, Andy has made the best of it to raise money and awareness for shelter pets. It warms our hearts to know Andy has served our country not just in the name of his countrymen and women, but in the name of our countrypets as well. We want to thank all of our veterans and active troops for their sacrifices, and wish for all those serving to have similar happy returns to their loved ones. If you are in a position to foster a pet, please consider fostering the pet of a troop facing deployment. Can You Foster a Bulldog? “Due to the aftermath of Irene many of our volunteers have been evacuated from their homes. 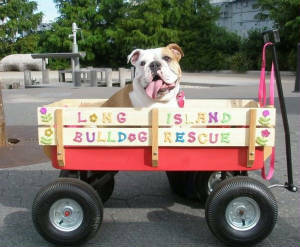 We are in urgent need of foster homes for incoming Bulldogs. If you can foster at this time, this would be of great help. If you are willing and able, please consider taking in a displaced pet.